The ultimate Kuala Lumpur Itinerary - Everything you need to know! For many travellers, Kuala Lumpur is just a gateway to Asia. In fact, Malaysia’s capital is an entirely underrated destination. We spent about 3 weeks in this awesome city and discovered that there are so many things to do in Kuala Lumpur Malaysia. Whether you plan to stay for just one day in Kuala Lumpur or for a longer visit, we will show you how you can have an absolutely amazing time in KL. The best way to start a day in Kuala Lumpur is by exploring one of the busiest areas in the whole city: Chinatown. Compared to areas like Bukit Bintang or KLCC, life seems to be a lot more fast-paced and beautifully chaotic. There are street vendors with their various goods, street food stalls with delicious aromas and a variety of beautiful colours. The beating heart of Chinatown is Petaling Street (see 1 on Map Chinatown). This famous street was not always the centre of Chinatown though. At the beginnings of Kuala Lumpur, Chinatown was centred more around Central Market. This was a good position because it was on higher ground and less prone to floods. A big part of the Chinese population worked in the tin mines at this time. The tin mines were abandoned during the Selangor Civil War in 1870 and when the workers came back to the mines, they were all destroyed by floods. The Chinese Kapitan Yap Ah Loy, who governed Chinatown Kuala Lumpur at that time, managed to persuade the Chinese population to stay in Kuala Lumpur and focus on the agricultural sector. With the help of Malay farmers, he opened a tapioca mill in Petaling Street. This was the beginning of the success of Petaling Street. is also called Chee Cheong Kai, which means starch factory street. These days Petaling street is mainly famous for the many things you can buy there. The range goes from souvenirs to Chinese herbs to fake branded clothing. Don’t forget to haggle for the best prices! Also, the food scene is absolutely fantastic with many street food stalls selling mainly Chinese dishes. On the way to the next attraction, the Sri Mahamariamman temple, you’ll see a great piece of street art from the Lithuanian artist Ernest Zacharevic. It’s called “Rage against the machine” (see 2 on Map Chinatown) and shows some kids destroying a school bus. The awesome thing about this street art is, that the school bus part is really half of an actual school bus. If you love street art, then this stop might even be one of the highlights on your Kuala Lumpur day tour itinerary. The newest trend in Chinatown is the cute little cafe’s that open up everywhere. We visited the Cafe ETC (see 3 on Map Chinatown), and the coffee was really delicious. To visit a cafe in Kuala Lumpur is also a perfect way to get a dose of air-con when it is really hot in the city. Very close to this cafe you can find the Sri Mahamariamman temple (see 4 on Map Chinatown). Founded in 1873, the Sri Mahamariamman temple is the oldest Hindu temple in Kuala Lumpur. While the temple was originally a private temple for the Pillai family, they opened it’s doors to the public in the late 1930’s. After you’ve seen the Sri Mahamariamman temple, you should head over to the Malaysia Heritage Walk (see 5 on Map Chinatown) at the Jalan Kasturi, next to Central Market. It is a kind of an open-air flea market with various street vendors. Opened in 2011, it’s still a rather new landmark of Chinatown, but worth a visit. You can buy there local snacks, faked-label clothing and also a lot of other stuff. Our highlight was the deliciously fresh juice from Juiceee! The next stop is one of the fun things to do in Kuala Lumpur and for everyone who likes awesome photo ops. The Illusion 3D Art Museum (see 6 on Map Merdeka Square) has 36 3D paintings waiting only for being used for your creative photos. As a result, we spent about an hour clicking some great pictures in funny poses. The highlight is the augmented reality room which was created in cooperation with the National Geographic Society. How many people can say that they were running away from dinosaurs or rubbing the belly of a polar bear? We think that this attraction is one of the best things to do in Kuala Lumpur with family. The Central Market (see 7 on Map Merdeka Square) is one of the famous landmarks of Kuala Lumpur. It was originally built in 1928 as a wet market but serves as an outlet for handicrafts these days. If you’d like to get your friends and family some great souvenirs, you should take a walk through the Central Market. In addition, it’s also the perfect place to have lunch in the food court on the second floor. You can get there a great choice of delicious and cheap Malaysian food. A short walk away from the Central Market you will find the historically important Merdeka Square (Independence Square) (see 8 on Map Merdeka Square). It was here where Malaysia declared its independence on the 31st of August in 1957. To honour this important event, what was then the largest flagpole in the world (328 feet/ 100 meters) was built. Today, the largest flagpole stands in Jeddah, Saudi Arabia (560 feet/ 170 meters). Merdeka square was originally used by the British to play cricket and was called Selangor Club Padang, which basically means Selangor Club Field. Around Merdeka Square are some impressive and beautiful buildings from the colonial era. One of the most impressive is the Sultan Abdul Samad Building (see 9 on Map Merdeka Square), built in 1897. This domicile was erected to house the offices of the British colonial administration and is one of the most beautiful things to see in Kuala Lumpur. In 1974, the building was renamed to Sultan Abdul Samad Building to honour the reigning sultan at the beginning of the construction phase. The whole building is constructed in an Indo-Saracenic Revival style and the clocktower in the centre is meant to resemble the Big Ben. The Royal Selangor Club (see 10 on Map Merdeka Square) is a social club founded in 1884 by the Brits who ruled Kuala Lumpur at this time. It was a meeting point for high-ranked and educated members of the British colonial society. The building was built with funds from the British colonial administration and was redesigned several times through the times. The club got the nickname “The Spotted Dog”, but it is not exactly known why. There are however some speculations. One of them says that the first club emblem supposed to show a spotted leopard, which was so badly drawn that people actually thought it was a dog. The next stop on your Kuala Lumpur tour itinerary is the majestic Sultan Abdul Samad Jamek Mosque (see 11 on Map Merdeka Square), also called Friday Mosque by the locals. This remarkable mosque was built at the junction of the Klang and Gombak River and completed in 1909 by the British architect Arthur Benison Hubback. At that time of its construction, it was the biggest mosque in Kuala Lumpur. It is built in the Indian Muslim Mughal architectural style. You are allowed to enter the mosque outside of the prayers, but make sure you’re dressed appropriately. Head over to the Kuala Lumpur Tower (see 12 on Map KLCC), known as the KL Tower. At 421 meters it is the 7th highest freestanding tower in the world and indisputably one of the most famous attractions of Kuala Lumpur. For anyone looking for a challenge, you can take the stairs all the way to the top. There is even a race to the top held annually. The record for men: 11 minutes and 56 seconds! For everyone else, there is of course also the option of taking the lift (phew!). Standing on the viewing platform of the KL Tower is definitely one of the best things to do in Kuala Lumpur! If you want to know more about its attractions, prices and opening hours, then you can check out the official webpage of the Menara KL Tower or get your ticket for the Observation Deck here. Just in front of the Petronas Towers (see 13 on Map KLCC), Kuala Lumpur’s most famous landmark, you can find a park with an artificial lake, a 1.3 km long jogging track and a huge children’s playground. Also, every night there is a light and water show at the lake. The towers are the obvious highlight. The 451.9 m high Petronas Twin Towers were once the tallest buildings in the world from 1998 to 2014. They’re built in an Islamic Pointed Star motif and each tower weights 300’000 tons, which is the equivalent of about 42’857 elephants! The double-decker bridge on the 41st and the 42nd floor is designed to slide in and out of the towers to prevent it from breaking. Furthermore, it is the second highest double-decker bridge in the world. Check out the official webpage to find out more about these impressive towers. The best way to get inside is if you book a skip the line ticket in advance. This way you don’t have to participate in the popular British national sport of cueing. On the opposite end of the KLCC park, you can find the Traders Hotel (see 14 on Map KLCC). Just enter the lobby and take one of the lifts to the 33rd floor. There you can find the awesome Sky Bar with a pool in the middle. Entrance is free and for a cocktail, you’ll pay about RM 45 (or about RM 24 for a mocktail). You also get the best view of the Petronas Towers in the whole of Kuala Lumpur. The dress code is smart-casual. And with this, we are at the end of the perfect one day Kuala Lumpur itinerary. If you’re still full of energy, check out this page to find the best things to do in Kuala Lumpur at night. There are so many more awesome things to do in Kuala Lumpur! Because people have different tastes and interests, here we present for you the best attractions so you can pick n’ mix your own perfect Kuala Lumpur itinerary. Seeing the Batu Caves is, without doubt, one of the top things to do in Kuala Lumpur. The Batu Caves are a series of huge caves within a limestone hill in Gombak, the northern part of Kuala Lumpur. The name Batu comes from a river called Sungai Batu (Stone River) which flows past the hill. The Batu Caves in Kuala Lumpur are dedicated to Lord Murugan, the Hindu god of war and victory. Especially relevant, the cave complex is one of the ten important holy shrines for Lord Murugan; 6 of them are located in India and 4 of those shrines are located in Malaysia. The huge (43 meters high) golden figure in front of the long staircase is a statue of Lord Murugan himself and the largest Murugan statue in the world. Right on the left side of the impressive golden statue, there is the long staircase up to the actual caves. There is no lift available, so you have to climb those 272 steps all by yourself. Try to go early and avoid the blistering sun! On the way up you’ll see a lot of monkeys and a lot of people bothering them. The monkeys might look cute, but we advise you to keep a fair distance and don’t feed them. If they bite, you’ll need a rabies injection. We saw some idiots who were even shaking some lamp-posts with monkeys on them. Please don’t be one of those idiots! The main cave is impressively huge. There are a lot of colourful Hindu statues there. Entrance to the main cave is free, but if you want to go on an exploration through the deeper Dark Cave you have to pay for a tour. You can check out the Batu Caves Kuala Lumpur entrance fee and opening hours on their official webpage. If you’d like to see the Batu Caves Kuala Lumpur on a tour, then check out this great offer. Also, if you like temples, have a look at the the Thean Hou Temple. I promise you’ll like it! The Lake Gardens (officially known as Perdana Botanical Gardens) are centred in the middle of Kuala Lumpur and one of the best places to visit in Kuala Lumpur if you’re searching for some rest and relaxation. The 91.6 hectares big park was established in 1888 as a refuge from the hustle and bustle of the then busy colonial city of Kuala Lumpur. There are various things you can do in this beautiful park as well. Here are some ideas of what to do in Kuala Lumpur Lake Gardens. The Kuala Lumpur Bird Park is the worldwide largest covered bird park and has more than 200 different species of birds. A lot of the birds like peacocks and storks are freely roaming the park and show little fear. One of the highlights is the bird feeding. You pay a small fee to get some bird food and then you can feed all the beautiful little lories in a smaller aviary. TripGourmet Tom changed his job. He’s a pirate now. We can recommend visiting the Bird Park Kuala Lumpur. There is plenty of space for all the birds to spread their wings and they are well-cared for. If you want to know more about the opening hours or the Bird Park Kuala Lumpur entrance fee, you can check out the official webpage or directly book a tour here. If you get hungry, there is also a pretty good restaurant called Hornbill Restaurant attached to the bird park. The majestic Hornbill we saw from the Hornbill restaurant. With more than 7000 square metres, the Kuala Lumpur Butterfly Park is the biggest of its kind in the world. Besides more than 5’000 live butterflies, the park also hosts exotic plants, live insects, freshwater turtles, and other animals. There is also a museum with a large collection of insects and butterflies from around the world. In the Lake Gardens, you can also find the National Planetarium of Malaysia. It is dedicated to all things astronomy and science and the best Kuala Lumpur attraction for kids to learn more about the planet and universe. There are some interactive displays and hands-on experiments available. If you love street art, then this is one of the coolest things to do in Malaysia Kuala Lumpur. While Penang is probably the best-known spot for street art in Malaysia, there is still a huge amount of great street art to be found in Kuala Lumpur. The probably best Street Art area in Kuala Lumpur is Laman Seni 7 in the deep southern suburbs of the city. The quickest way is to take a taxi or book a Grab. You could however also take the KTM Komuter train south towards the direction of Klang and get off at the Padang Jawa station. From there it’s only a very short Grab/Taxi/Uber ride to Laman Seni 7. If you want to know more about the Street Art scene in Malaysia you should check out Exploring the fascinating street art world of Malaysia. There are also a lot of other great articles about street art on streetartchat.com. If you’re more interested in shopping than culture and nature, then you’ll find the best shopping places in Kuala Lumpur (and possibly the entire world) in the Bukit Bintang district. There are several gigantic shopping centres where you can find whatever you can think of. Click this link if you want to know more about the shopping paradise of Bukit Bintang. Our favourite mall was the Pavilion. There are over 550 outlets to be found within this huge complex. We mainly loved this place because of its supermarket with loads of western food choices and because it houses some of the best restaurants in Kuala Lumpur. Like its counterpart in Ipoh, the Sunway Lagoon Theme Park Kuala Lumpur offers a lot of fun for old and young. The different areas of the park called Water Park, Amusement Park, Wildlife Park, etc., will make sure that you’ll have an awesome day out. Check out the official page to find out about prices and opening hours or book your ticket easily directly here! For this Kuala Lumpur activity, you’ll definitely need a whole day. The aquarium Kuala Lumpur, called Aquaria KLCC, is a state-of-the-art oceanarium with over 5000 different species of water and land animals. One of the highlights is its 90-metre transparent underwater tunnel from which you can observe Sand Tiger sharks, Marine turtles, Giant Stingrays and a lot of other sea creatures. It’s definitely one of the best attractions in Kuala Lumpur if you are interested in marine life. To check the current prices and opening hours you can check their official homepage or get your E-Ticket here. This stunning mosque was build in 1965, the year when Singapore and Malaysia split. It was designed in a collective effort from the British architect Howard Ashley and the Malaysian architects Hisham Albakri and Baharuddin Kassim. The majestic dome is star-shaped with 18 points which represent Malaysia’s 13 states and the 5 pillars of Islam. Furthermore, the National Mosque (Masjid Negara) is big enough for 8’000 people. The most prominent feature is definitely the 73-metre high minaret. Especially if you stay for a longer time in Kuala Lumpur, you should think about a trip to the third biggest city of Malaysia: Ipoh. There is a lot to discover in Ipoh and it already has the reputation of being the secret food capital of Malaysia. Indeed, if you travel for food, Ipoh is almost a must-visit when you go to Malaysia. It is also a great destination if you love to explore magnificent mountain cave temples and street art. You can comfortably book a one-day Ipoh tour from Kuala Lumpur. The Cameron Highlands is the perfect place to visit from Kuala Lumpur if you need a break from the heat. The hilly landscapes bring fresher temperatures and some wonderful views. Because of this climate, it is an optimum location to grow tea plants. If you want to see beautiful tea plant terraces (We recommend to visit the BOH Tea Plantation), love to go on scenic hikes or pluck some strawberries, then the Cameron Highlands the perfect destination for a day trip from Kuala Lumpur. And in case you prefer beaches over hill, then we recommend you to read this great post about Kapas Island in Malaysia, one of the underrated jewels of this beautiful country. From the mountains to the jungle. Taman Negara (translated to National Park) is one of the oldest rainforests in the world and one of the best attractions near Kuala Lumpur. You can visit it on a day trip or even stay in one of the hotels or guesthouses in Kuala Tahan, the entrance to the Taman Negara. There are a lot of great things to do in Taman Negara, like exploring the forest at night, go on some rapid shooting (awesome fun! ), go on unguided or guided hikes or visit a tribe of indigenous people (the most authentic indigenous experience we had so far). The easiest way to explore the beauty of this place is a guided tour. Malacca is a coastal town south of Kuala Lumpur and its city centre is a UNESCO World Heritage Site since 2008. The city has been under the colonial rule of the British, the Portuguese and the Dutch, which you can see clearly in the architecture of the pretty buildings. It is maybe one of the most picturesque cities in Malaysia and definitely worth a visit. You can easily visit it on a day tour from Kuala Lumpur. The main reason to visit Kuala Selangor are the hundreds of fireflies you can see here on an evening Firefly Boat Tour. It is said that there are only two places in the world where you can see magical fireflies, and this is one of them. Do you like this post? Then pin it on Pinterest! The food scene in Malaysia reflects the diversity of the culture. There are so many different kinds of cuisine you can find in the amazing city of Kuala Lumpur. But not only in the capital itself you can find delicious food. Check out our food guides for Penang and Ipoh if you want to dive deeper into the diverse food culture of Malaysia. There are many more places which serve awesome food in the Jalan Alor Kuala Lumpur, but those were definitely some of our favourite ones. If you’re interested in discovering more of the best eating places in Kuala Lumpur, then we can recommend this Kuala Lumpur Food Tour. The best Chicken Wings ever? Another great place if you like street food. Here you can find mainly Chinese or Chinese influenced food. It is a great alternative to Jalan Alor, especially if your accommodation is situated in Chinatown. For grabbing lunch near the colonial area of Kuala Lumpur we recommend you go to the second floor of the Central Market. There you can find a food hall with many choices of different food. We can recommend getting some Asam Pedas (sour and spicy fish stew) from the Pedas shop. The food tastes really delicious and is very cheap. The Lot 10 Hutong Food Court was the first of its kind which encouraged hawkers to sell their delicious dishes within a food court. These days you find there food stalls of the best hawkers of whole Malaysia. Of course, the dishes are absolutely lipsmackingly good! Try for example the Penang Famous Fried Koay Teow and you’ll know what I mean. This food court is a standout contender for the best food in Kuala Lumpur. We had the best burgers in Asia in this burger place! If you want top quality burgers in Kuala Lumpur then there is no way past this great location. Try the Mushroom/Swiss cheeseburger or the California Cheese Skirt and you’ll know why we love this place so much! We loved the quality of the Japanese food Ippudo serves. Located inside the Pavillon shopping mall this place is perfect for any Ramen cravings. The restaurant has a very relaxed atmosphere and the prices are decent. Weissbrau serves authentic Swiss and German comfort food. Try for example the Bratwurst with mashed potatoes and Sauerkraut. The best thing about this place? They also serve German beer. If you love a good steak then you should definitely have a look at this place. The steaks we had were cooked to perfection and served with a variety of salts on a side plate. The service was impeccable and the atmosphere perfect for a date night. A little tip for whiskey lovers: Next doors is The Whiskey Bar which serves more than 400 labels from around the world. This is the most expensive meal we ate in KL, but it was worth it. This is another food vendor within a shopping mall. We had some mouthwatering Curry Laksa and Nasi Lemak Rendang there. The quality and taste were fantastic and the price very fair. Oven cooked food is very rare in southeast Asia. This famous Korean chicken restaurant serves oven baked chicken and potatoes. The chicken was perfectly crispy on the outside and tender on the inside. The Kuala Lumpur Light Rail Transit (LRT) and the monorail are two of the main transportation modes to get around in Kuala Lumpur. There are four main lines, the Kelana Jaya LRT line, the Ampang LRT Line, the KL Monorail line and the Sri Petaling line. You can find out more about the fares and the routes on the official webpage. Another public transport to get around in Kuala Lumpur. Some of the stations stop underground. You can find out more about it here. The KLIA (Kuala Lumpur International Airport) Express is one of the fastest ways to get from the airport Kuala Lumpur into the downtown of Malaysia’s capital. A one-way ticket costs about RM 55 and the ride takes less than half an hour. On the KLIA Express, you even get high-speed WiFi. The train departs every 15 minutes. One of the easiest and cheapest transportation modes to get around the huge capital of Malaysia is definitely the Go KL City Bus. It is a free bus in Kuala Lumpur, with four different routes and serves most of the important tourist attractions within the city. Each Bus has free WiFi and Air-Con. Because of their inconsistent time schedule, we cannot recommend taking the RapitKL Bus Kuala Lumpur as a tourist. Grab is very popular in South East Asia and a better alternative than taxis. It is a lot cheaper and widely available. The fact that you don’t have to haggle for a price and that you can even pay cashless makes it a very attractive option to get around in Kuala Lumpur. You can download the App in the iTunes Store and on Google Play. We don’t recommend taxis as most of the drivers refuse to put the meter on or have rigged meters. Use GRab instead, or be prepared to haggle hard. The Komuter train is rather made for locals than residents, but it still serves two important destinations for tourists. One of them is the Batu Caves and the other one is the Padang Jawa station for the Street Art at Laman Seni 7. The best point to get on this train is from KL Sentral. To get to the Cameron Highlands and Taman Negara a good option is to get private tour operators who offer transfers as part of their services. We took Han Travel and were happy with it. Another operator who offers transfers is NKS Travel. The Bukit Bintang Area is perfect for when you want to be close to a lot of Kuala Lumpur attractions and the big shopping malls. It’s also the area where Jalan Alor, the famous street food street, is situated. If street food is not your favourite kind of food, then you can also find some great restaurants in this neighbourhood. There are a lot of hotels and apartments to be found in this part of Kuala Lumpur with prices ranging from reasonable to very luxurious. Click here to find the best accommodation in Bukit Bintang. KLCC is the perfect area if you are looking for luxurious 5-star hotels in Kuala Lumpur city centre and the best views in the whole city. This is the only neighbourhood where you can enjoy the perfect view of the Petronas Towers when you get out of bed. If you’re looking for the best and most glamorous Kuala Lumpur hotels, then KLCC is for you. Click here to find the best accommodation in KLCC. Chinatown is a great area if you want to stay in central Kuala Lumpur. You are very close to the Petaling Street and all the delicious street food stalls this area offers. It is also close to Bukit Bintang. There are a lot of budget and mid-range options available in this lively neighbourhood. Click here to find the best accommodation near Petaling Street in Chinatown. You’d like to stay in a luxurious hotel but don’t want to be within all the hustle and bustle of KLCC? Then Dataran Merdeka is the best location in Kuala Lumpur for you. 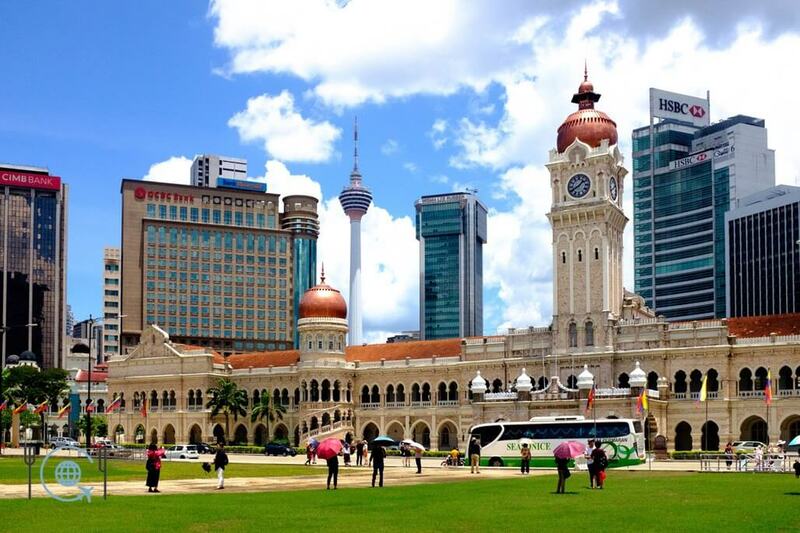 The area around the Merdeka Square gleams with beautiful buildings from the colonial era. A lot of them are 5-Star hotels these days. It’s still easy enough to reach all the important sightseeing points as well. Click here to find the best accommodation in Dataran Merdeka. Brickfields, also known as Little India of Kuala Lumpur, lies in the area around the transportation hub of KL Sentral. You can find here a lot of cheap hostels with clean rooms and free WiFi. The proximity to KL Sentral makes it perfect to explore the city but still keep your accommodation costs cheap, consequently making it the best area for when you’re backpacking in Kuala Lumpur. Photo credit goes to Veronika Bockova. Click here to find the best accommodation in Brickfields.